Creating good human society means having confidence in humanity’s inherent wisdom. That wisdom, worthiness, workability at the core of our experience- what we find when we connect with our hearts- that is basic goodness. Acting based upon our trust in these qualities is how we create a society that expresses those very things. 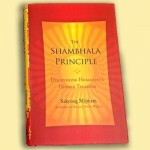 The Shambhala principle is the principle that humanity- both ourselves and our society- is inherently good. Not “rainbows and unicorns good”. Not “lack of suffering and never making a mistake” good. Good in the sense that we all possess wisdom. Within our hearts lies brilliance, intelligence, and an ability to relate to the world as it is with compassion and dignity. This notion is neither new nor exclusive to our tradition. It is something that has been recognized for ages by people of many religions, philosophies, and frames of reference. Now is the time to illuminate this truth. The premise is that society as a whole already possesses all the wisdom it needs. We as human beings are intelligent and capable. And we are invited to have confidence in this. Once we trust this basic core, then how we manifest in the world reflects that. When we trust our wisdom, we see the wisdom in others. We look for and see the wisdom and goodness of our communities, even in the difficult situations. We are willing to relate to suffering. To look it in the eyes. To notice how we feel. To work with it, with people and situations as they are. This is bravery. When we start to relax into bravery and genuineness by continuing to trust ourselves and our world, we cultivate compassion. We care about others. We want to help. do so, even. We offer our own energy and excitement and willingness to what it is we are doing. We don’t have to head up a huge project or change the face of our field in order to engage in inspired work. How we raise our children, speak to our clients, or communicate with our parents are all expressions of enlightened society. The important thing is that we are connected to our hearts and willing to relate to our lives.